On this date in 1912, Montenegro declared war on the Ottoman Empire, opening the First Balkan War and moving Europe one step closer to the conflagration looming in 1914. Immediately after the declaration, Montenegrin armies crossed into the Sanjak of Novibazar – the narrow strip of Turkish territory separating Montenegro from Serbia – and advanced on Scutari (Shkodra), an important port city lying on the Adriatic Sea just south of Montenegro. Montenegro only put about 45,000 troops in the field, but the little kingdom was merely the standard-bearer for the Balkan League, whose other members would join the war against the Ottoman Empire on October 18. Bulgaria would contribute over 350,000 troops, Serbia 230,000 troops, and Greece 125,000 troops to their combined military operation against the Turks. These forces, totaling around 750,000, faced Turkish forces totaling around 335,000 in Europe. The Turks could draw additional troops from their Asian possessions, but the Balkan League hoped to achieve victory before reinforcements arrived (the Greek navy would also help slow Turkish reinforcements by running interference against the Turkish navy in the Aegean Sea). 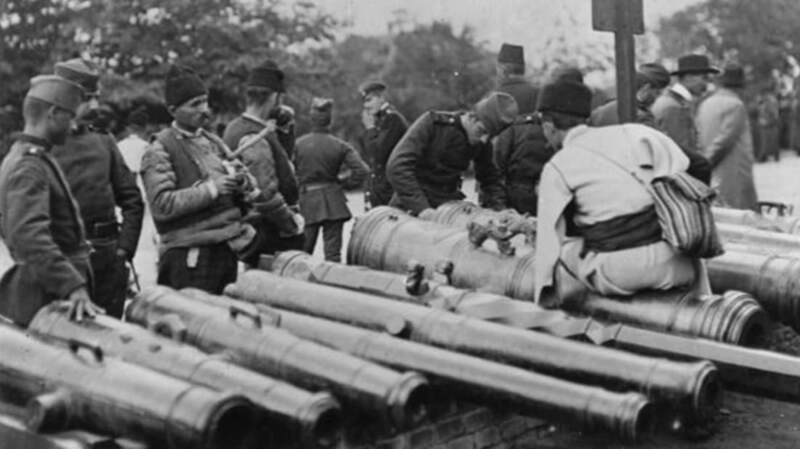 Although the Balkan League ultimately won a huge victory over the Turks in the First Balkan War, they soon fell to fighting each other over the spoils in the Second Balkan War in 1913. The main dispute was between Bulgaria and Serbia, which both claimed former Ottoman territories in Macedonia; while they’d previously agreed to submit any disagreements to Tsar Nicholas II of Russia for arbitration, the mild-mannered autocrat and his indecisive foreign minister, Sergei Sazonov, were unable to come up with a compromise satisfactory to both parties, spelling even more trouble down the road. Indeed, while the First and Second Balkan Wars were confined to the Balkan Peninsula, they would have continent-wide ramifications foreshadowing the Great War to come. All four members of the Balkan League came out of the conflicts with increased territories and populations, which meant they could field bigger armies in future, making them more threatening to their neighbors. Serbia, in particular, emerged from the Second Balkan War with greatly enhanced power, prestige, and self-confidence. Following the Balkan Wars the neighboring Great Powers, Russia and Austria-Hungary, also adopted more assertive foreign policies, increasing the risk of a much wider European war. By failing to mediate effectively between Serbia and Bulgaria over their competing claims to Macedonia, Tsar Nicholas II ended up alienating Bulgaria, leaving Serbia as Russia’s only ally in the Balkans; from now on, to retain its regional influence Russia would have to back Serbia no matter what, even if this brought it into conflict with Austria-Hungary. For its part Austria-Hungary, vigilant against Slavic nationalism, was determined not to allow Serbia to score any more military or diplomatic victories. The hawks in Vienna, led by army chief of staff Count Franz Graf Conrad von Hötzendorf, bitterly criticized foreign minister Count Leopold von Berchtold for bungling Austria-Hungary’s response to the Balkan Wars, beginning with his failure to preemptively occupy the Sanjak of Novibazar; the next time an opportunity presented itself, the Viennese war party vowed that Austria-Hungary wouldn’t miss its chance to settle accounts with Serbia.